The show gradually established its position as anti-establishment with the stagecraft of Mission Accomplished, to the exaggerated rescue of Jessica Lynch in Iraq, to the death of Pat Tillman to Hurricane Katrina, to the "Nexus of Politics and Terror," to the first "Special Comment." As he listed a number of prominent supporters of his show, he ended up notably giving credit to the late Tim Russert of NBC for being "my greatest protector, and most indefatigable cheerleader." I think the same fantasy has popped into the head of everybody in my business who has ever been told what I've been told, that this is going to be the last edition of your show. You go directly to the scene from the movie Network - complete with the pajamas and the rain coat - and you go off on an existential, other worldly verbal journey of unutterable profundity and vision, you damn the impediments, and you insist upon the insurrections, and then you emit Peter Finch's guttural resonant, "So." And you implore, you will the viewer to go to the window, open it, stick out his head and yell, well, you know the rest. In the mundane world of television goodbyes, reality is laughably uncooperative. When I resigned from ESPN 13 ½ years ago, I was literally given 30 seconds to say goodbye at the very end of my last edition of Sports Center. As God is my witness, in the commercial break just before the emotional moment, the producer got into my earpiece and he said, "Um, can you cut it down to 15 seconds so we can get in the tennis result from Stuttgart?" So I'm grateful that I have a little more time to sign off here. Regardless, this is the last edition of Countdown. 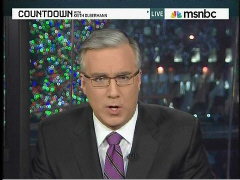 It is just under eight years since I returned to MSNBC. I was supposed to fill in for the late Jerry Nachman for exactly three days. Forty-nine days later, there was a four-year contract for me to return to this nightly 8 p.m. time slot which I had fled four years earlier. The show gradually established its position as anti-establishment from the stagecraft of "Mission Accomplished," to the exaggerated rescue of Jessica Lynch in Iraq, to the death of Pat Tillman to Hurricane Katrina, to the "Nexus of Politics and Terror," to the first "Special Comment." The program grew and grew thanks entirely to your support, with great rewards for me, and, I hope, for you, too, though on many occasions, particularly in the last two and a half years, where all that surrounded the show - but never the show itself - was just too much for me. But your support and loyalty - and if I may use the word "insistence" - ultimately required that I keep going. My gratitude to you is boundless, and if you think I've done any good here, imagine how it looked from this end as you donated $2 million to the National Association of Free Clinics, and my dying father watched from his hospital bed, transcendentally comforted that his struggles were inspiring such overwhelming good for people, he and I and you would never meet, but would always know. This may be the only television program wherein the host was much more in awe of the audience than vice versa. You will always be in my heart for that and for the donations to the Cranik family in Tennessee and these victims of governmental heartlessness in Arizona, to say nothing of every letter and email and Tweet and wave and handshake and online petition. Time ebbs here, and I want to close with one more Thurber story. It is still Friday. So let me thank my gifted staff here and just a few of the many people here who fought with me and for me. Eric Sorensen, Phil Alangi, Neal Shapiro, Michael Weissman, the late David Bloom, John Palmer, Alana Russo, Monica Novotny, my dear friends Rachel Maddow and Bob Costas and my greatest protector, and most indefatigable cheerleader, the late Tim Russert. And now, let me finish by turning again to this ritual of reading Thurber stories to you.